Thank you for joining us at China Institute’s 2018 Blue Cloud Gala! To say it was a spectacular evening just doesn’t cover it. The décor set the tone for our evening of magic and our talented musicians and dancers dazzled the ears and eyes. Our emcee, Arthur Ch’ien, kept our event moving smoothly while China Institute trustees Didi Pei, Yue-Sai Kan and Anla Cheng helped clearly shape and articulate the achievements and successes of both the organization and our distinguished honorees. We invite you to see photos, honoree videos, the performances and speeches, media from the event, and more below. Read our post-gala press release. Enjoy the full event recording of the 2018 Blue Cloud Gala. The diverse and extraordinary accomplishments of our 2018 honorees reflect the mission and work of China Institute to provide U.S. and global audiences a deeper, more nuanced understanding of China and the tools to navigate this changing landscape. Jillian Sackler, through her philanthropy, is building cultural bridges between peoples around the world. With her husband, Dr. Arthur M. Sackler, they donated research centers, health centers, and art institutions that have greatly contributed to our society. As president and CEO of the Dame Jillian & Dr. Arthur M. Sackler Foundation for the Arts, Sciences & Humanities, she founded the Arthur M. Sackler Colloquia at the National Academy of Sciences in Washington, DC, the Sackler Wing of Galleries at the Royal Academy in London and the Arthur M. Sackler Museum of Art and Archaeology at Peking University in Beijing, China. She is a trustee of the Royal Academy of Arts, Friends of Mexican Development Foundation, American Film Institute, Foundation for the National Institutes of Health and is also the first female chairman of the Foreign Policy Association. Howard P. Milstein leads a family that has been prominent in business and philanthropy for four generations. He is Chairman, President and Chief Executive Officer of New York Private Bank & Trust and its operating bank, Emigrant Bank (the country’s largest privately owned, family-run bank). He also chairs and operates the Milstein family’s real estate companies, including Milstein Properties, Milford Management and various Milstein Brothers entities. Howard is founding Chairman of the merchant bank FriedbergMilstein. Among his international business ventures, he is Executive Chairman of the Nicklaus Companies, which operates worldwide and has designed 50 golf courses in China. He has partnered with the Lu family to bring his unique wealth management model to China. In 2011, he created the Milstein Medical Asian American Partnership Foundation (MMAAPF) to contribute to world health and harmony by developing mutually beneficial partnerships between the United States and China, as well as greater Asia. More recently, he joined the Board of the National Committee of U.S. China Relations. John S. Long is the Founder and Chief Executive Officer of Highridge Partners. Mr. Long is recognized for developing a multi-disciplinary analytical approach, an interactive management style, and an ability to anticipate market movements to create opportunistic real estate investment strategies. Mr. Long has been noted for his immense support and involvement in the academic and civic community over the years. Mr. Long and his family foundation have established the UCI Long Institute, which focuses on bridging common understanding between US and China in the areas of business, law and society. 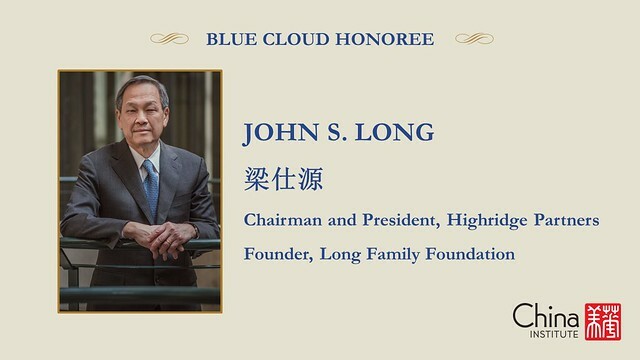 Mr. Long is the Founding Chairman of the UCLA Real Estate Center as well as a member of the UCLA Foundation Board of Governors and the UCLA Anderson School’s Board of Advisors. Mr. Long also serves on the Advisory Board of the Asia Society of Southern California. Born in Nanjing, China in 1953, Liu Dan currently works and resides in Beijing. He lived in the United States between the early 1980s and 2005 before returning to China. Liu Dan is among the most original and significant living artists in China. While working with the triad of ink, paper, and brush – the one constant in an otherwise highly diversified tradition for Chinese ink paintings in the past centuries – Liu Dan has pioneered an idiosyncratic idiom in the contemporary practice of ink that redefines the boundaries of the convention. Public collections with his works include The British Museum, London; Musée Guimet, Paris; Andrew Mellon Foundation, New York; The Arthur M. Sackler Museum of the Harvard University Art Museums, Cambridge, Massachusetts; The Brooklyn Museum, New York; the Minneapolis Institute of Art, Minneapolis and so forth. Recent museum exhibitions include Art and China After 1989: Theater of the World (Solomon R. Guggenheim Museum, New York, 2017); Ink Unbound: Paintings by Liu Dan (Minneapolis Institute of Art, Minneapolis, 2016); Liu Dan: New Landscapes and Old Masters (Ashmolean Museum of Art and Archeology, Oxford, 2016). The Great Poets of Antiquity in China praised those who inspired and achieved great heights as “soaring amid blue clouds”. In 1984, China Institute’s then-President Wan-go Weng created an award, “Qingyun” or “Blue Cloud”, the traditional Chinese symbol of high virtue and status, to be given to individuals whose exceptional achievements contribute significantly to U.S.-China friendship and understanding. 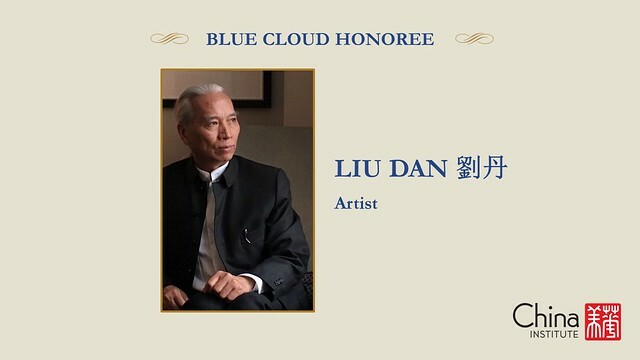 Ever since, China Institute bestows its Blue Cloud Award to notable figures who share our mission and values. Arthur Ch’ien, Emmy-Award winning journalist, served as Master of Ceremonies. Learn more about how you can support China Institute!